The traditional warning to people who hunt, fish or walk in the wild is not to surprise a mother bear protecting her cubs. Female bears with their young are often thought to be a threat to human beings. But a new report says lone male bears are more dangerous than the females. And the report has suggested that the males may have developed behaviors different from the females. Stephen Herrero is a retired professor at the University of Calgary in Canada. He led the study of bear behavior. Results of the study were published in the Journal of Wildlife Management. Mr. Herrero and his team studied records of human deaths from black bear attacks in the wilds of North America. They examined records between nineteen hundred and two thousand nine. They found that sixty-three people died in fifty-nine incidents during that time. The attacks took place in the United States and Canada. Black bears are more common in North America than brown bears or the brown bear known as a grizzly. Many experts also say black bears are by far the least aggressive. Published reports say up to nine hundred thousand black bears live in North America. Mr. Herrero says the animals are safer to be around than dogs, snakes or bees. Black bears have killed about two people a year over the past ten years. The researchers blamed most of the deadly attacks on bears searching for food. The report says eighty-eight percent of bears in those attacks acted like a predator. In other words, they captured and fed on other animals. And ninety-two percent of the bears that showed predatory behavior were male. Each of the deadly attacks considered predatory was made by a single bear acting alone. Mr. Herrero says people who have training can learn to recognize a predatory bear. He says a demonstration of strength does not mean that the bear means to kill a person. Mother bears with cubs are a good example. When they see people, he says, they often run at them and make a lot of noise. The professor says, "They want you to think they will eat you alive. But they almost always stop." He advises people to back off quietly. By comparison, he says the predatory male follows people. The bear senses that the people are targets, perhaps for food. Then it silently attacks its target. Mr. Herrero advises aggressive action. "Fight back," he says. The study found that a killer male may be starving. But he also may not be hungry. Other findings from the report confirm some commonly accepted beliefs about bears. For example, one or two people are more likely to be targets than a group. And bears that have killed a human are more likely to kill again. The study also confirms other widely held beliefs about bears. For example, the report says people’s food and containers for waste attract bears. And it says bears that live around humans do not usually carry out deadly attacks. Eighty-five percent of deadly attacks in the wild were recorded since nineteen sixty. Mr. Herrero says he and other researchers are often asked if this means that bears are changing their behavior. Or, they are asked if people are changing their behavior, or both. To those questions, he notes that the human population has grown greatly in the past half century. He says there are more people in the woods for both recreational and business activities. This means increased chances for attacks. How can you recognize a black bear? It may not be easy. Surprisingly, not all black bears are completely or even partly black. Some have large areas of black fur. But they may have brown noses and white areas on their chests. Other kinds of black bears appear silver or have other colors. The group Defenders of Wildlife describes black bears as between a half-meter and three fourths of a meter at the shoulders. It says males weigh an average of sixty eight to one hundred fifty-eight kilograms. But some males can weigh up to two hundred thirty kilograms. Females may weigh anywhere from about thirty kilograms to one hundred forty kilograms. Black bears eat plants, fruits, nuts, insects, fish and small animals. Sometimes bears, both male and female, can be victims. Vehicles and logging operations can harm them. And killing bears is popular in some parts of North America. But many places on the continent ban it. Or they limit the period when these animals may be hunted. 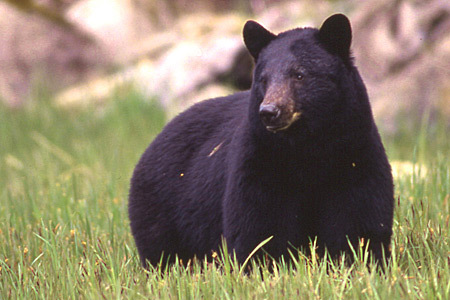 Several American states list black bears as threatened. Mexican officials call them endangered. But Defenders of Wildlife says populations in the United States and Canada are staying the same or growing. Some areas are taking steps to protect black bears. For example, many black bears have been in the path of recent floodwaters in the American south. During recent flooding in Louisiana, officials considered wildlife as well as humans when they delayed opening the Morganza flood barriers. The officials said they hoped black bears would have time to escape to safer ground. The officials also warned people that they may catch sight of displaced black bears. They said the water may cause the bears to go where they have never been before. This SCIENCE IN THE NEWS was written by Brianna Blake and Jerilyn Watson. I’m Faith Lapidus. And I’m Bob Doughty. You can find transcripts, MP3s and podcasts of our programs at voaspecialenglish.com. Join us again next week for more news about science in Special English on the Voice of America.